Montgomery had a long tenure in professional baseball. He was signed as an 18-year-old and started at the D level (which is akin to Rookie ball in today’s nomenclature) in 1962 for Olean of the New York-Pennsylvania League. He played remarkably well, hitting .273/.426/.380 and found himself in A ball for Waterloo the following year. He made stops in Seattle, Winston Salem, Pittsfield, Toronto and Louisville over the next eight years, amassing 3,061 minor league plate appearances and a .276/.323/.406 line – not bad for a catcher in the 1960s. He was called up to the Boston Red Sox in 1970 and never looked back. 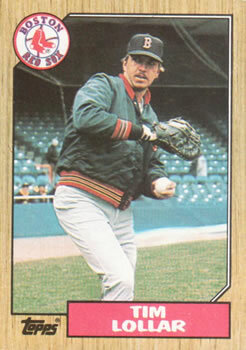 Still, the Sox had a fella by the name of Carlton Fisk, so Monty didn’t see a whole lot of playing time. He didn’t see a whole lot of green either, as he apparently sold Red Sox tickets in the winter months. What does that even entail? Did he go from sandlot tosandlot hawking seats for mid-summer Orioles tilts? More than likely he went to businesses and the like, but it’d be pretty cool to buy tickets to a game from an actual player. I would certainly pay more for that experience. It takes players putting butts in the seats to a whole new level! 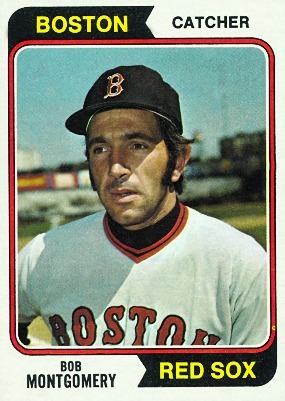 Any who, Montgomery played for Boston from 1970 – 1979 and got in a total of 387 games, that’s just 38.7 a year. 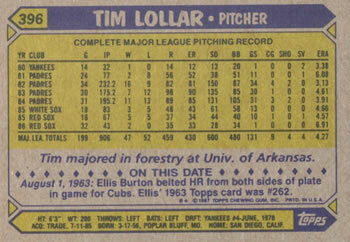 He finished with a .258/.296/.372 line – totally serviceable for a back-up catcher in the 1970s. Oddly enough, he hung them up after one of his most successful campaigns: he hit .349/.374/.419 in 1979 in 92 plate appearances. 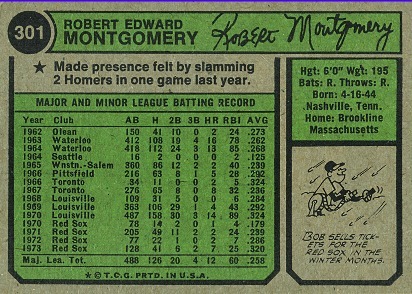 That said, as this card accurately points out, Monty, who was known as “The Hammer,” made his presence known on June 6, 1973 by slamming two homers in one game. Those homers directly contributed to his best year in the bigs: .320/.353/.563 and 1.5 WAR. 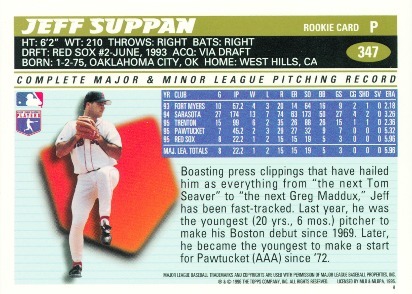 He amassed just 1.9 WAR for his career. Still you can’t take those sideburns away from him – he could get some mean shooting stars in there! You also can’t take away that June 6 game. 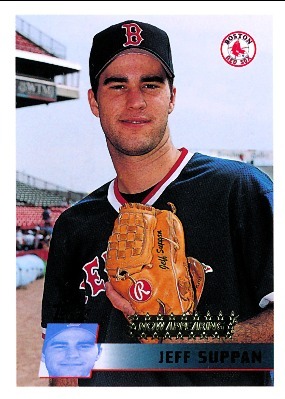 He hit both homers off Doug Bird (who went 4.2 IPs in relief of Ken Wright). The Hammer’s second home run came in the bottom of the 10th to give Bill Lee the complete game victory. Baseball use to be crazy. Lastly, someday, somewhere, Montgomery will be the answer to a trivia question as he was the last Major League player to bat without a helmet. Maybe that’s why he retired – the game had passed him by. Craig MacTavish anyone?